With the Bugeater GT done, I’ve actually been able to do some hobby work. I always rotate between completing fantasy army and a 40k army. Partially that’s to keep things fresh, but that’s also because I mentally see-saw back and forth between the two game systems. Right now I’m on a major 40k kick after the amazing time I had with the 40k team tournament at Adepticon. I have loved the Horus Heresy books since they first started coming out years ago, and after some other local guys starting building their own Heresy era army, I knew I had to as well. 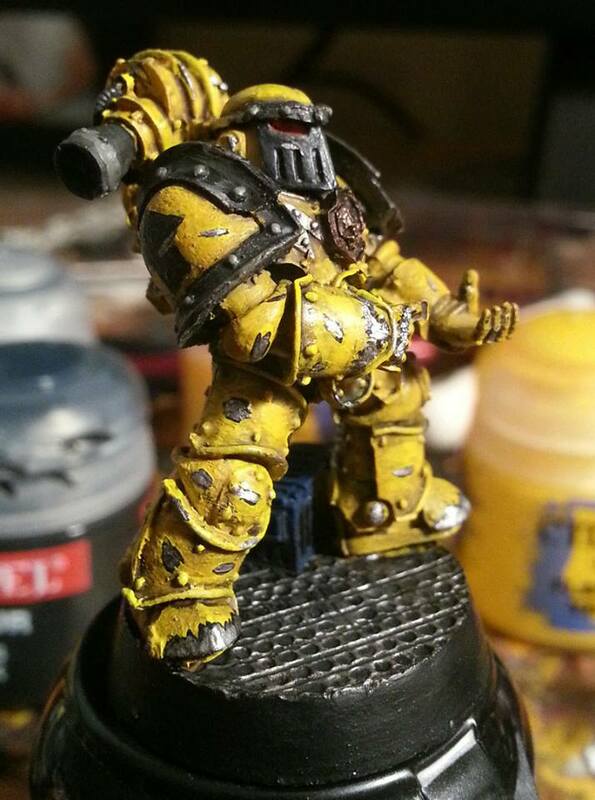 My test model for the Imperial Fists. I absolutely love the Mark III armor now – I think it is the best looking space marine armor out there. I had originally started working on my own take on one of the lost legions – the Legio II. That might be something I do in the far distant future, and the models I did complete are safely tucked away, but it’s hard to use the Legio II in a team tournament environment. On the way home from Adepticon we discussed what we’d like our theme to be, and we settled on some part of the Ullanor Campaign. We already knew Russ would do some guard, and Jon wanted to do Ultramarines while Matt wanted to do Imperial Fists since they both liked those legions and the fluff makes it clear those two legions actually fought at Ullanor and weren’t just participating in the parade. In initially settled on the Dark Angels because they could’ve fought at Ullanor and I really wanted to run a Mortis pattern Contemptor (and the Mortis pattern was the Dark Angels baby). Then a few weeks ago, Matt announced he wanted to do Salamanders instead. 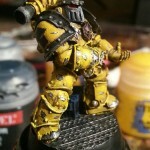 Once he showed me that he had painted up his realm of battle tile in Salamanders colors I knew he was serious, and I switched over to the Imperial Fists. Thankfully, this didn’t set me back too much. I had assembled a bunch of marines in generic Mark II / III armor, and only the sergeants were in robes. I carefully removed the shoulder pads, arms, and helm from the robbed bodies and put them on the two leftover Mark II bodies I had. Like many individuals, for me painting models usually happens in spurts: I get really inspired for a short while, and then I get fatigued and take a good amount of time off before I feel inspired enough again to bust out the brushes. One night, in the week after the Bugeater, I felt possessed to paint up a test model from start to finish. 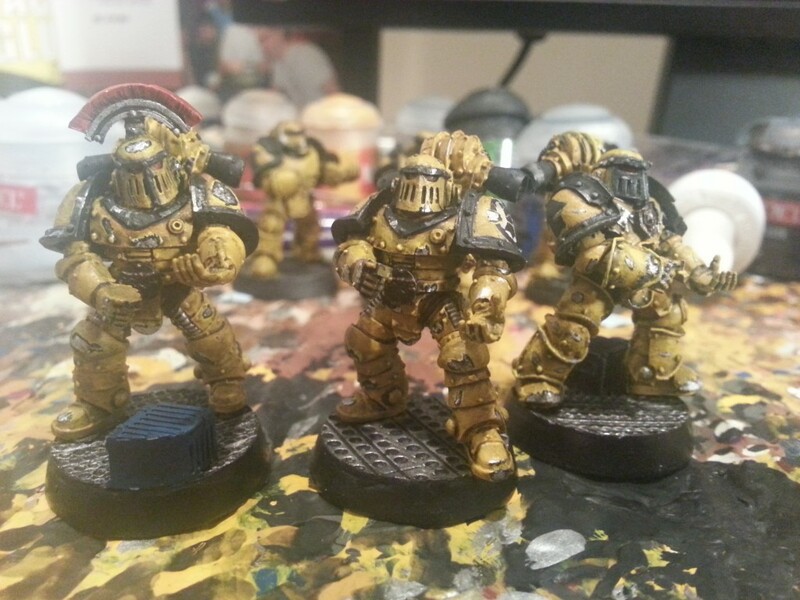 I wanted to do this right (yellow is a tricky color to pull off well), and have a battle worn look for these guys. I painted him up, used some decals (that I quickly painted over), and did a nice three step technique for chipped paint / battle damage. I was really happy with how he turned out. The other guys on our team seemed to like the product too and I immediately went to work on some more of his battle brothers. I’m holding off on finalizing my 1000 point list, mainly because the new Space Marine book is due to come out this fall. 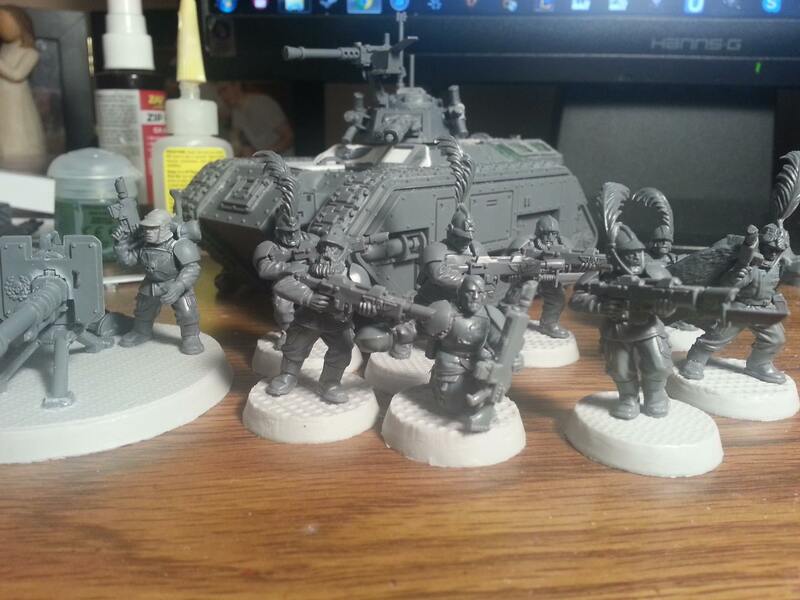 But I know that the core of the army will have two tac squads, so I know it will be safe to paint up those marines. I managed to get a few more models completely done before I had to take off for debate nationals, and I’m pretty happy with the results. I don’t like Mark 2 as much as I like Mark 3 armor, but I wanted my squads to have blends of 2, 3, and 4 armor types. A quick picture the night before I went out of town for debate nationals. I think the battle worn look is really fitting for the Fists, especially given the theme I’m going for. I’m using bases from Secret Weapon Miniatures (pictured) and Dragon Forge (not pictured yet), because I imagine the Fists are doing ship to ship action (the Imperial Fists were tasked with occupying the Ork fleet in Ullanor while the Luna Wolves struck at the heart of the Ork Empire). I think our team is going to look really sharp since we’ll have Imperial Fist yellow, Ultramarine blue, and Salamander green on the same team. Jon and Matt are decent painters, so it will look really sharp. Now for my own competitive play, I want to ally the Fists with Guard. I have several reasons for doing this: first 6th edition is a shooting edition, and I almost think that the Astartes need guard allies to get the requisite number of bodies and shots on the board. Second, we’ll have a guard member of the team, and this will give me practice having both armies on the board and figure out how they can work the best. Third, I really enjoyed the combination of the two forces in my last two games of the team tournament this year. Finally, it’s just plain fluffy! The Legio Astartes almost always had Imperial Army contingents with them during campaigns. And on top of that, I’m doing the Fists “buy the book” to stay true with the 40k fluff, but there were so many Imperial Army units I could allow my creativity in background writing some release with the Army. To that end, I made up some quick fluff that I’ll round out over time: since the Fists are so Earth-centric, I wanted to pair them with a Terran Army unit. I decided to create the 7th Terrawatt Lancers. The Terrawatt Clan controlled the Ural Mountains and their impressive forges pre-Unification (the same forges that Ferrus Manus and Fulgrim made weapons at). I imagined that some soldiers of the clan saw the might of the Emperor and wisely pledged their allegiance to him. As such, they are part of the “Old Hundred,” fighting forces from pre-Unification that were allowed to maintain their traditions and organization as thanks for their loyalty to the Emperor. I wanted to make them unique, but still decidedly Imperial. To that end I used cadian bits, but mixed in a bunch of stuff from the Fantasy Empire range: stuff from the Pistollier, Knight, and Greatsword kits. I also used Sandwyrm’s impressive set back Chimera tutorials to modify the Chimeras to give them a distinct (and in my opinion, much better) look. I’m really happy with it as it continues to take shape. So, I did all that in a week. It’s amazing how much time you have when you’re on summer vacation and not running a GT! 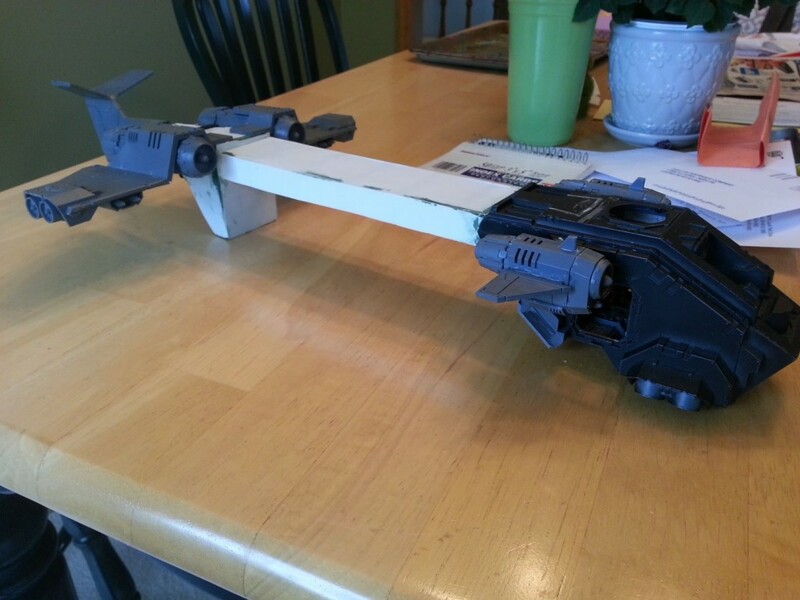 I already can’t wait to get home from debate and work on my Fists some more and tinker away with the stormraven transport. Posted in Warhammer 40k and tagged adepticon, horus heresy, imperial fists, space marines, warhammer 40k.